Canterbury’s Christmas windows were stunning this year! We really enjoyed hosting the Best Dressed Christmas Window Competition. With 50 entries, we were spoiled for choice. Across the city centre shops, large and small, restaurants and coffee houses decorated their windows in innovative, surprising and magical ways to delight and attract their customers. On 5th December, Small Business Saturday, an expert team of judges spent two hours assessing each of the windows in turn and marking them for ‘festivity’ ‘merchandising’ and ‘creativity’. John Siddique, Canterbury’s Poet Laureate, Beth Cuenco, Wise Words Festival Director, Bill Hutton, owner Hutton Design and Rachel Phipps, a distinguished food blogger toured the city to see the beautifully decorated windows for themselves. The winners will be presented with their certificates by The Lord Mayor of Canterbury, Sally Waters, and BID Chief Exec Bob Jones on Friday 18th December. You can browse a selection of photos on our Flickr Album and read Rachel Phipp’s Blog here. Canterbury retains the Purple Flag Award for the 6th year running! 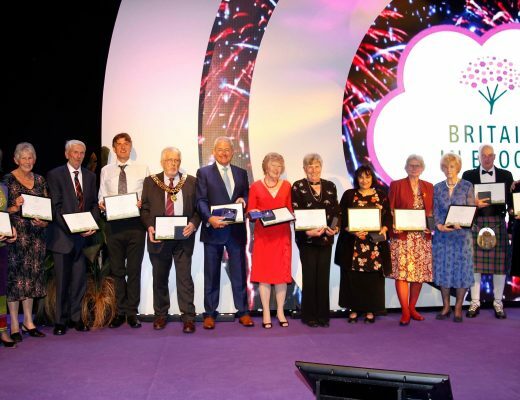 Canterbury Wins Gold in Britain in Bloom! Canterbury Connected Business Improvement District (BID) is an independent, business-led, not-for-profit initiative voted for by the businesses of Canterbury on the 18th July 2014 to ensure continued investment in Canterbury City Centre. Our mission is to help make Canterbury a vibrant, exciting, well connected and successful business community; an attractive, clean, green, safe and enjoyable destination for customers and clients, shoppers and staff, residents, students and visitors; and a profitable place in which to do business.